Summer 2013 has come and gone, and I find myself with an ever growing list of adventures and experiences to blog/journal about. I have been so caught up in the moments that I've forgotten to properly documented the memories. The end of summer also marked another milestone in this grand little adventure that was supposed to take the McCoy family from Kentucky to Serbia and back again in three years time. Isn't it funny how life never really seems to go as planned?! Our international journey has not followed anyone's predictions, but we sort of like it that way. Chris and I have been living and working overseas for two years and four months; and in that time we moved from Kentucky to Subotica, Serbia (as planned), and then from Serbia to Roeselare, Belgium (not planned, but welcomed), and now we find ourselves in Regensburg, Germany. . . . absolutely not planned, but we figured we had moved before, and we could do it again! What's one more move to shake things up a bit? Chris and I have been officially living in Regensburg, Germany for about three weeks, and everything is still so new. Once we feel a little more settled and 'normal,' I plan to document the process of our most recent move. In the meantime though, there are so many other things that I need to catch up on! While living in Belgium, Chris and I were lucky to live 40 minutes away from one of the most famous breweries in the world. For beer enthusiasts, the mere mention of Saint Sixtus of Westvleteren makes you salivate. For everyone else, don't worry, I'll fill ya in on some of the basic details. Saint Sixtus is one of only six remaining Trappist breweries in Belgium (apparently both Germany and the Netherlands each have one of their own). 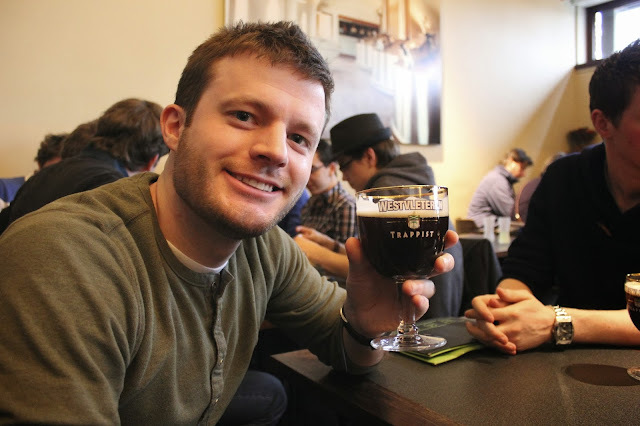 For a brewery to be classified "Trappist" some of the main requirements are that the beer must be brewed by monks (or under the supervision of monks), and the beer must not be sold to turn a profit but rather to keep up the monastery and monastic life. What makes Saint Sixtus different from other Trappist breweries is that the monks do all of the brewing; no outside brew master has been hired to increase production or better the product. It doesn't seem like they have much to improve upon anyhow, because since 2005, ratebeer.com has continually rated Westvleteren 12 as the best beer in the world. After such a lofty award, this tiny brewery in a remote corner of Belgium became like a Mecca for beer lovers. Even with such high demand, the product is almost impossible to get your hands on. If you travel to the brewery, you can try the beer in their onsite cafe called In De Vrede (make sure to check opening times to avoid disappointment), but you'll be lucky to walk out with your own stockpile. There are rules about getting a crate (like the ones pictured above), but every so often, the gift shop will sell off enough beer to pay for a repair around the monastary. I'm serious! If the monks need a new roof or replacement windows, they will increase production and allow the gift shop to sell a limited amount of beer. 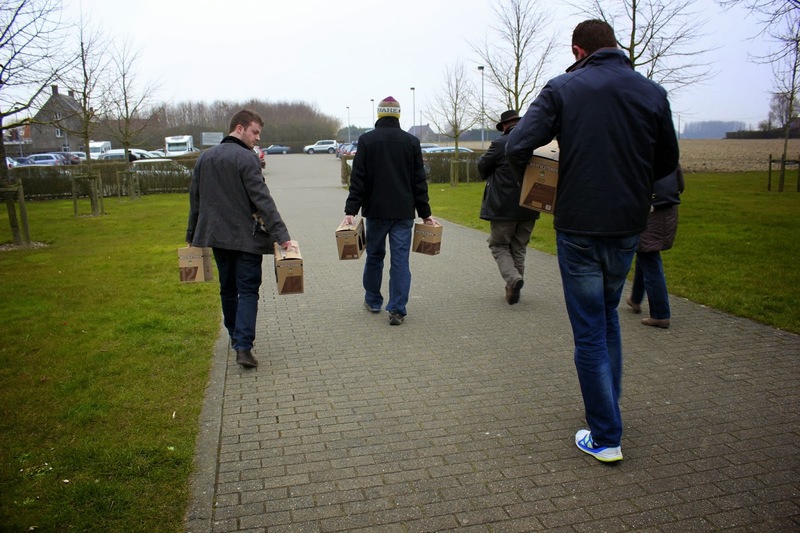 We were lucky to go to Saint Sixtus of Westvleteren on one such glorious day. 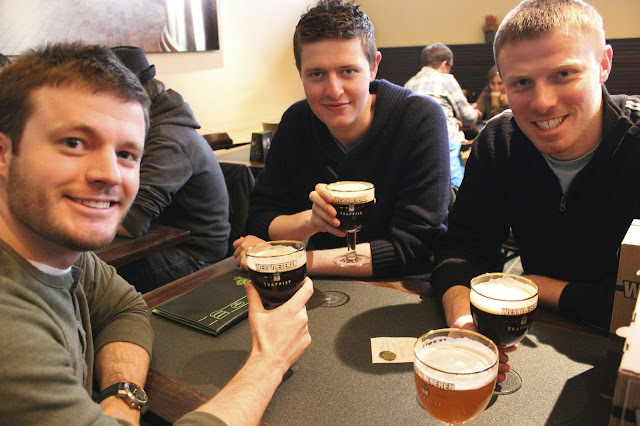 Chris and I had our best friend, Reece, and his friend Ross in town over a weekend in April, and we randomly decided to take a drive out to Westvleteren to sample a few beers at the cafe. As we walked in, we noticed a line of 15 or so people in the gift shop. Without discussion, we all jumped in line and bought the allotted 12 beers per person/per day. Shortly after purchasing our beers, the gift shop ran out of product and disappointed a whole lot of anxious customers. We greedily sat down at the cafe and enjoyed a frosty Westvleteren while keeping a protective eye on our stash of beer to go. Chris is still holding onto most of his precious treasure for a very special occasion. 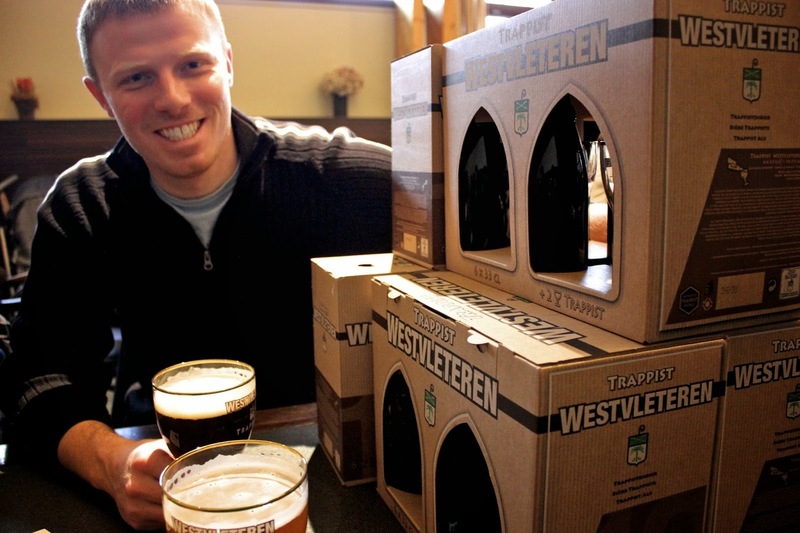 If you love beer and you're visiting Bruges, rent a car and drive out to Westvleteren! If you're lucky, you may even be able to buy a few beers to take home in your suitcase! I hear they can sell for up to $100 a bottle in America! Anyone know if this figure is accurate? HINT: Before you go to In De Vrede, call ahead and ask if they are selling! Like specialty beer? Check out my post of Weltenburg Brewery which is said to be the oldest monk brewery in the world. 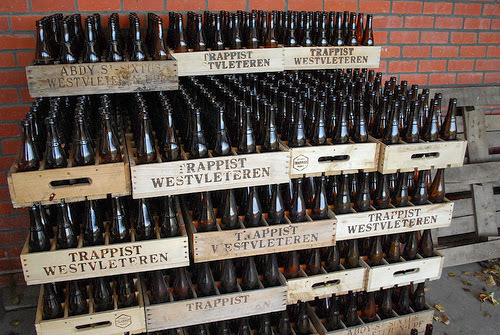 They are not "Trappist" though because they sell their beer for a profit in restaurants and stores. Check their website (http://www.sintsixtus.be/bierverkoopactueel.htm) to see when they phone reservation line is actually open - it's typically only manned a few days a week between 8 and 12. Thanks Hanney! That is great info! 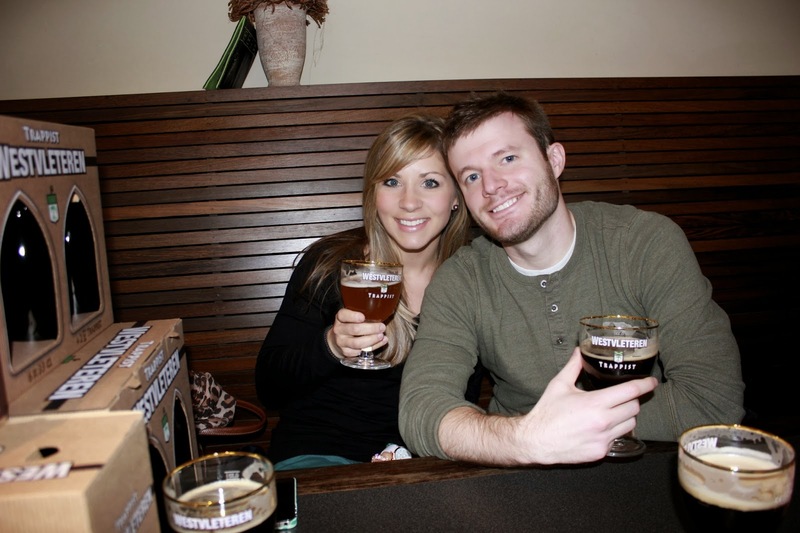 Unfortunately we aren't living in Belgium anymore, but we are planning return trips to see friends and Westvleteren (duh!). My husband loaded up about 300 Belgian beers in our moving truck! The stuff is legendary!